Guest post by: Tibor Schiemann, President and Managing Director, TuneUp. Does it take an eternity for your PC to boot up? Have you trolled the web for some tips on improving it? Unfortunately, there are some really bad tuning advices out there, but here are four Windows boot optimization tweaks you can definitely trust. Turn off unnecessary start-up programs. Third-party applications can slow things down quite a bit depending on your system, so go through the list of start-up entries and get rid of the programs you’ll never use or need. This won’t just help improve boot time; it should also reduce the number of annoying pop-ups informing you to take various actions. I actually tested this tip by disabling 19 start-up entries on one system and 25 start-up entries on another. It was surprising to see that neither machine had significant improvements in terms of boot time, but I noticed that my systems were much more responsive right after logging on and during general use. This is because disk usage significantly decreased once these start-up entries were turned off. Since much less is going on during the boot-up process with the start-up entries disabled, you can start working with your computer much more quickly after logging on. You’ll also regain both CPU and RAM resources, which will help speed up the applications you’re actively working with. While you probably won’t notice a huge improvement in boot time like in my test, this tip will help you be more productive and conserve system resources. Disable devices in Device Manager. PCs and laptops come with several built-in devices or other components that you may not need, such as a Bluetooth transmitter, an Ethernet adapter, a web camera or a sound chip. Windows does not need to reserve interrupt requests (IRQs) and memory resources and load up drivers if the devices are disabled, so turning them off should improve boot time. I again put this tip to the test and used Device Manager to turn off several devices, including a webcam, virtual DVD drives and all USB ports and controllers. Boot time went down by a couple of seconds on both of my test machines once the devices were disabled. This tip also had a neat side effect—it helped me preserve battery power on the laptops. Get more RAM for your PC. This is always a good thing to do, but does it really help improve boot time if you’re just upgrading from 1 GB to 2 GB or from 2 GB to 4 GB? Since core Windows system files, drivers and basic services all amount to less than 1 GB, boot time shouldn’t be affected. However, more RAM should drastically reduce swapping memory to the disk. I used msconfig to limit the total memory used by my test systems and see how upgrading RAM affected boot time. As expected, the computers’ start-up times steadily improved as more GBs of RAM was added, and on an Asus tablet (Core i5, 4 GB of RAM, SSD drive), boot time decreased noticeably. Tweak your BIOS, which may slow down boot time due to unnecessary checks or settings. To combat this, set boot priority to your hard disk, for example, and disable booting from your DVD drive, USB port or network; by doing so, you should be able to shave a couple of seconds off your system’s boot time. Try to find the “Boot” category in your BIOS, and set your PC to look only for a bootable operating system on your hard disk. But, don’t forget to set it back in case you decide to install a new operating system or run a USB rescue environment. Also, try to find the “Quick Boot” option and set it to “Enabled” to skip the boot analysis of hardware components. These are the four most effective (and safe) ways of improving Windows’ boot time. 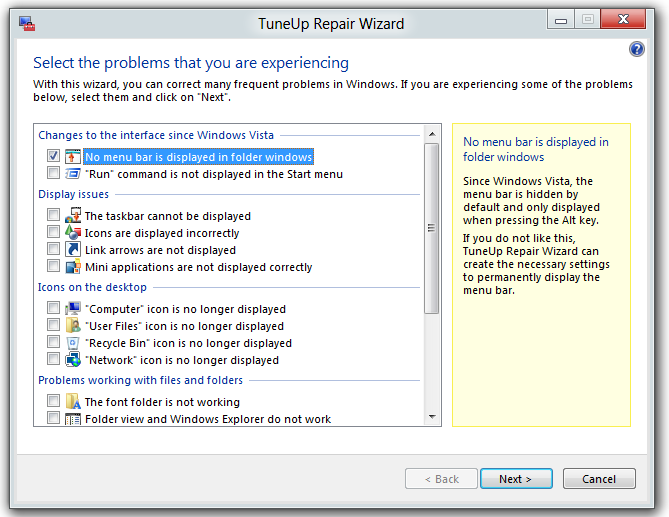 Visit the TuneUp Blog about Windows (http://blog.tune-up.com), where we’ve sifted through misleading optimization tips and tuning information, to learn more and make sure that you are maximizing PC performance. 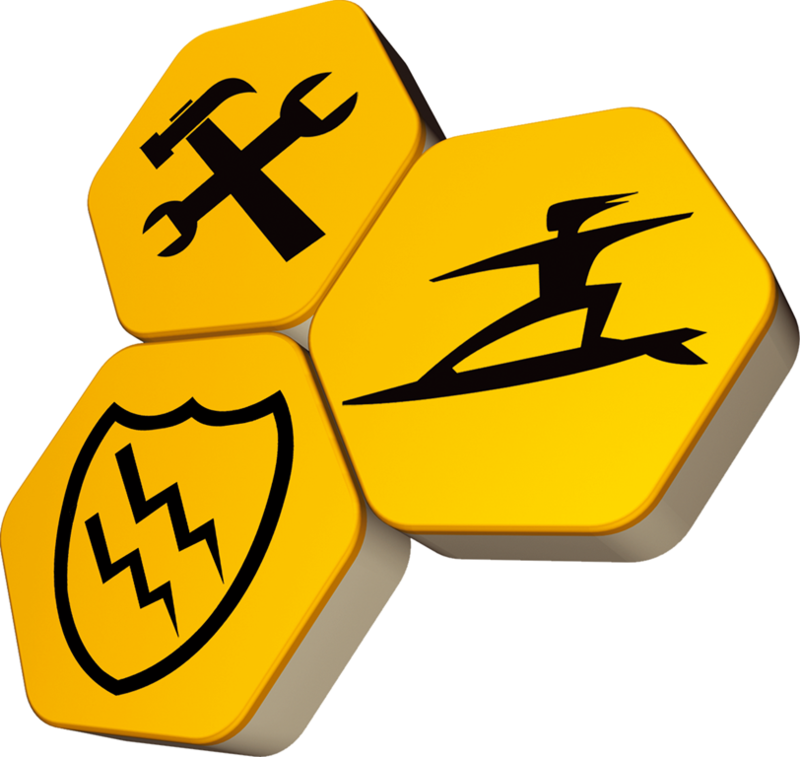 System Mechanic 10– a highly effective performance-tuning application designed for the average user. System Mechanic is the most inclusive system application I have ever tested. And, the developers have managed to do this in such a way, that an average user does not have to drill down through complex menu structures to correct performance issues that negatively impact his computing experience. 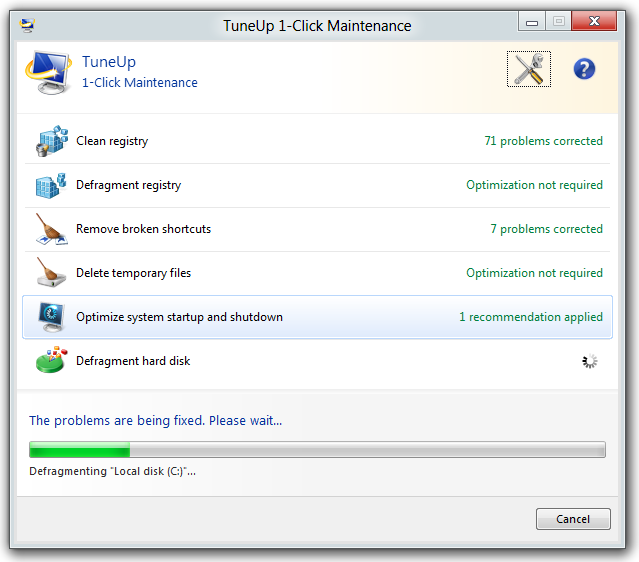 In a first for iolo, System Mechanic’s developer, they have released a cut down freeware version of the this powerful tune-up application – System Mechanic Free. 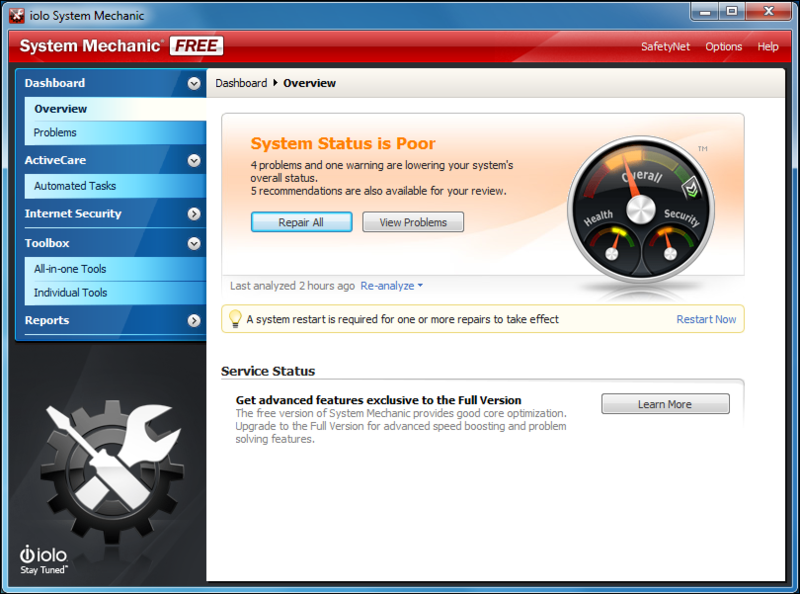 System Mechanic Free is comprised of 7 powerful core tools, designed for system repair and maintenance, which follow the times tested “one click simple” user interface developed in the commercial version of System Mechanic. An ideal GUI for both novice and power users. Registry Tuner: The most effective tool of its kind, Registry Tuner uses regularly updated research to safely repair registry errors and stabilize Windows computers. Startup Optimizer: Eliminates the top 25 most common startup bottlenecks in order to noticeably speed up Windows start time. Memory Mechanic: Reclaims more RAM memory for an instant performance boost. PC Cleanup: Cleans up system-clogging junk files and clutter. 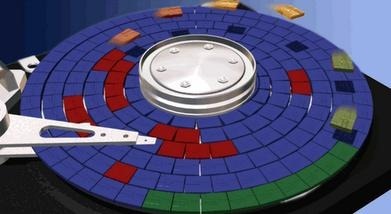 Drive Accelerator: Defragments hard drives to improve drive speed and performance. Shortcut Repair: Reconnects broken icons and shortcuts. Internet Connection Repair: Heals broken internet connections to get PCs back online. I should point out, I have not tested System Mechanic Free, but I have had substantial experience with the commercial version, and the tools included in this freebie. They work as advertised. Download at: iolo (read the page carefully to ensure you download the free version). 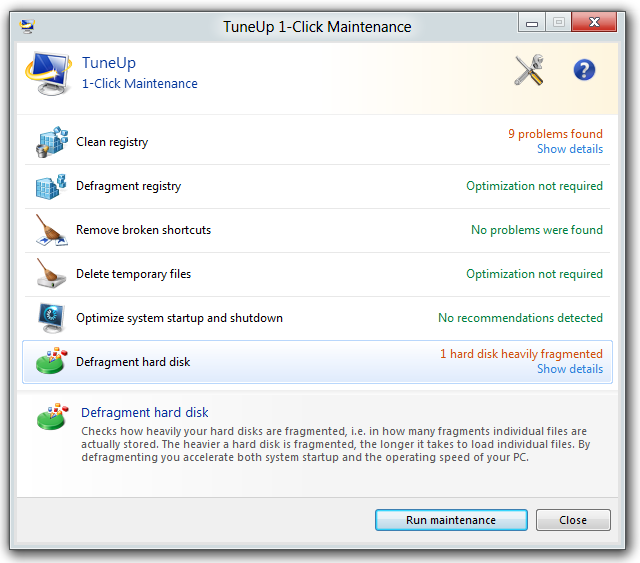 In this article, guest writer Tibor Schiemann, President and Managing Partner of software developer TuneUp, (the TuneUp Utilities 2011 folks), takes the mystery out of why low disk space can slow your computer to a crawl. No matter how fast your PC is, low disk space can slow any computer down, especially newer ones with fast, solid-state drives (SSDs). In fact, low disk space is typically the #1 reason for a sluggish machine, and one that is even overlooked by IT pros. In order to tackle this issue, it’s first important to understand why low disk space significantly slows down programs, affects SSD drives, increases load times and causes dozens of error messages. Windows and most third-party programs need disk space to breath. Windows, for example, needs space for its paging file, which extends a PC’s physical memory (RAM) in case it runs out. When there is low disk space, the paging file can’t grow when required and impacts PC performance. Low disk space can also reduce SSDs’ speed, as it requires these flash-based disks to read single data cells into memory before writing new data. This will even crash read/write performance. Depending on its demand, the paging file dynamically increases and decreases in size. Imagine if your PC’s disk space were to fall below the 500 to 1000 MB limit. Once the paging file tries to increase and hits the disk space limit, you can expect terrible performance, and your system will most likely crash. Windows isn’t the only system depending on at least a couple GB of free disk space; many applications create files to store data temporarily. PhotoShop, for example, is known to create a “scratch disk” when running. This disk has a dynamic size ranging from a couple of hundred MBs to several GBs. Expect PhotoShop, or any other application for that matter, to run poorly or not at all once this temporary file takes up the rest of your hard disk limit. Unfortunately, this problem persists on modern machines as well. Take a netbook, a low-budget notebook or even a high-end machine with an SSD drive. Your music libraries or even stored photos might just be enough to hit the limit quickly—add the regular size of a typical Windows installation (20 GB) and applications, and you’re working at the limit of their disk’s capacity. Of course, I wanted to test this theory to make sure that low disk space is, in fact, a serious performance threat. For the tests, I used an Intel Penryn C2D with 3 GHz, 4 GB of RAM and an SSD. In order to run low on disk space, I simply duplicated a couple of files that were several hundred MB until I hit the disk space limit. Surprisingly, once my disk space sank below the dangerous 100 MB mark, the PC didn’t suffer. This is probably due to the fact that both my RAM and the default paging file compensated for the current memory need. However, things got shaky once I started to work more heavily. Programs and applications suddenly wouldn’t start, and those I was currently running didn’t react. For example, iTunes didn’t respond to any clicks—it froze yet kept playing music in the background. And the PC’s performance continued to take a turn for the worse when I maxed out disk space. The boot procedure took more than twice as long, according to XPerf from Microsoft’sWindowsPerformanceToolkit. Since many of my regular programs refused to launch, I couldn’t benchmark the start-up times for many applications. After trying Outlook, PhotoShop, Indesign and even Live Messenger, I was finally able to get Internet Explorer 9 to launch. But, time basically stood still the moment I clicked on the web browser icon—nothing happened. After about 13 seconds, the web browser appeared on the screen and started to load a website, and that was all I could do—the system was unusable. Given my test results, low disk space is certainly a performance killer. Luckily, there are several tips to follow that can help you quickly rescue your system from low disk space. First, TuneUpUtilities 2011’s Gain Disk Space feature can be used to remove unnecessary files and old backups, while TuneUp Disk Space Explorer can help you find huge data hogs. It’s also helpful to do some routine maintenance and use Microsoft’s Windows Disk Cleanup tool. Additionally, uninstall unnecessary Windows features and remove large programs that you no longer need to free up your machine’s disk space. This “FiveWaystoGetRidofDataClutter” blog post provides step-by-step instructions on how to implement these tips. It’s important to keep a close eye on the amount of free disk space your computer has. When disk space starts running low, make sure to take the necessary steps to improve performance and get your machine back up and running again in no time. 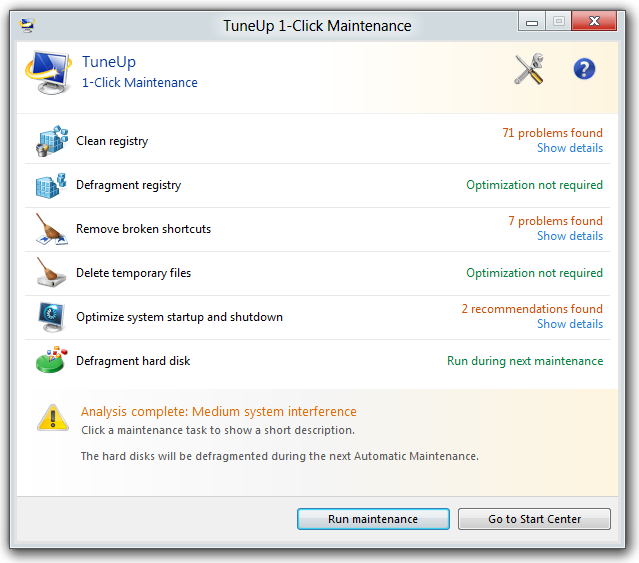 For additional tips and tricks on maintaining PC performance, I invite you to visit the TuneUp Blog about Windows (http://blog.tune–up.com). 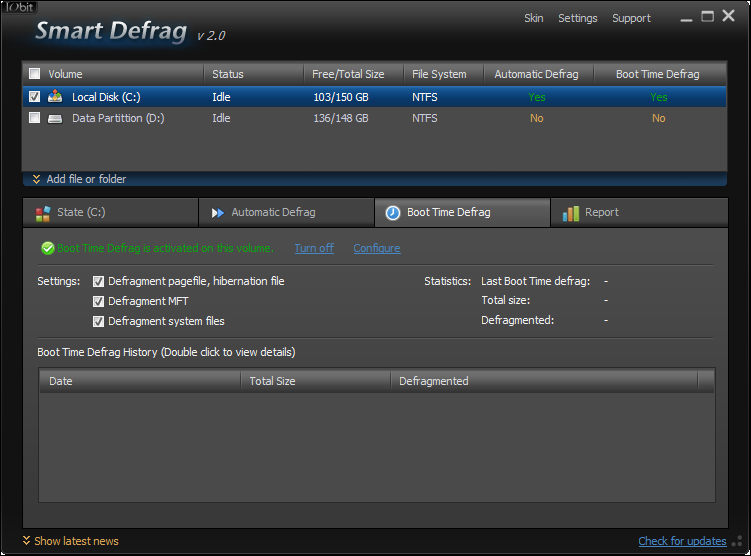 IObit announces a new version of their free disk defragment software – Smart Defrag 2. In a real sense, it’s often difficult to measure an increase in system performance following Hard Drive defragmentation. 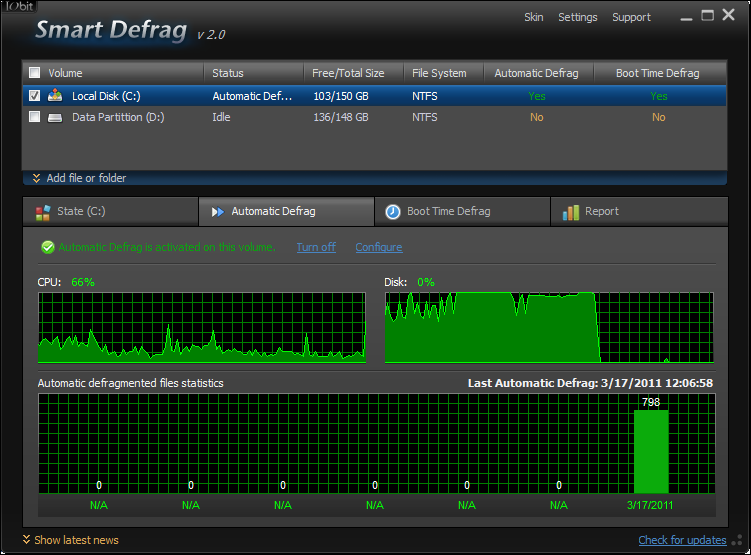 Nevertheless, I do agree, that defragging is a positive maintenance process, and should be done regularly. A quick recap on disk fragmentation: What is it? Creating and deleting files and folders, installing new software, and downloading files from the Internet, will cause a Hard Drive to become fragmented. When you delete files or folders, the first available empty spaces on the Hard Drive are filled in randomly when you create new files and folders – as you do when you save pics from your camera, install software, save emails, or create documents. 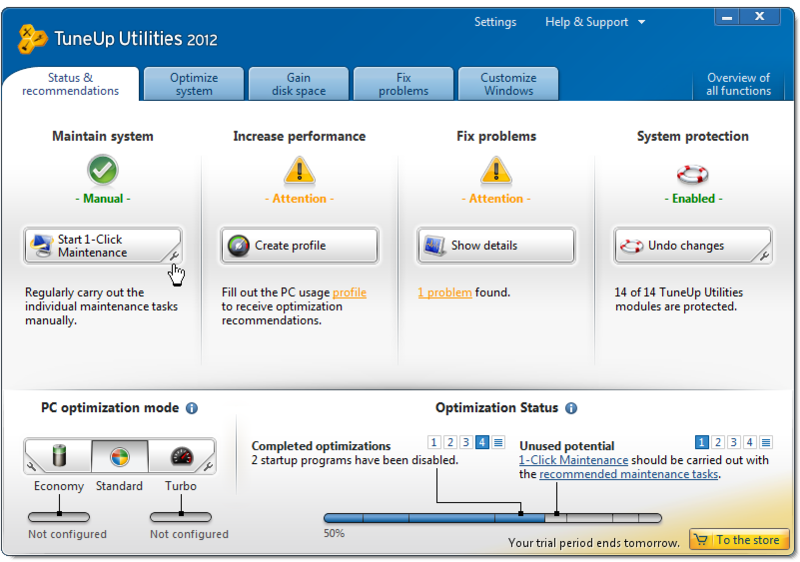 To keep fragmentation to a minimum, I run the paid version of TuneUp Utilities 2011 in the background, which continuously optimizes, amongst other things, my computer’s hardware, including automatic disk defragging. 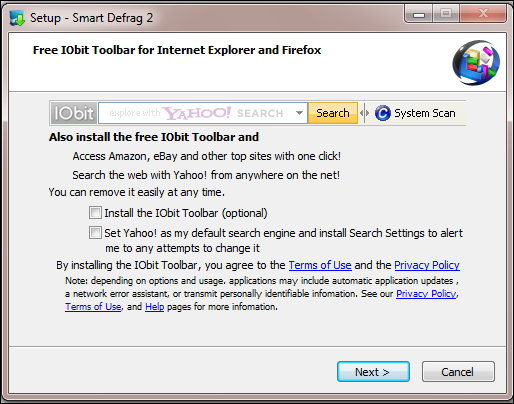 The latest release (March 18, 2011 ), of the award winning free system tool, IObit Smart Defrag 2 , can also run on this type of “set and forget” basis. I occasionally hear from users that they can’t remember the last time they defragged their disk/s – they’ll get to it – eventually. But, they don’t have to – IObit Smart Defrag 2, can do this for them on a continuous basis. Sporting a brand new user interface, (which remains uncluttered), IObit Smart Defrag 2 continues to be easy to use, and as in previous versions – it’s fast and efficient, and best of all, it’s free. NEW – Boot time defrag allows files which can’t be defragged, or moved while the system is running, to be defragged. These files include pagefile, hibernation file, MFT, and system files. 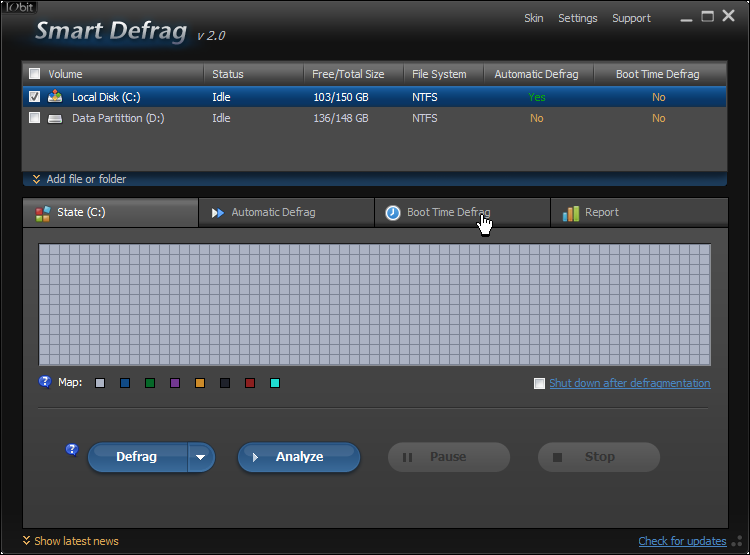 If you’re running the automatic defrag feature, you’ll have ready access to a simple reporting tool. Running a full defrag, and full optimization (which places frequently used files and folders into the fastest area of the disk), took just a few minutes. Extremely Fast and Efficient Defragmentation Enhanced – Using IObit’s latest defrag engine and the new “Boot Time Defrag” technology, Smart Defrag 2 has not only the world’s fastest defragmenting speed but also the most advanced defragmenting ability. It’s been specially designed for modern, large hard drives, which eliminates the long waiting time. 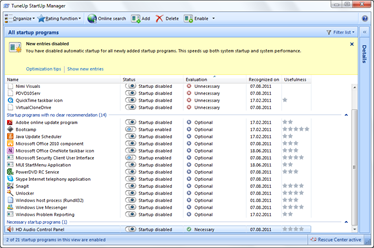 Always-on Automatic Defragment Enhanced – Smart Defrag 2 works automatically and quietly in the background, so it continually and constantly keeps your computer fragment-free. New! “Boot Time Defrag” Technology – Smart Defrag 2 uses a new “Boot Time Defrag” technology which allows you to defrag files during the system boot process – files which cannot be defragged or are not safe to move after the system is already up. System requirements: Windows 7 (32-bit and 64-bit), Vista (32-bit and 64-bit), XP (32-bit and 64-bit) with SP2/SP3 or Home/Professional/Media Center, and 2000. Languages: English, Albanian, Arabic, Brazilian Portuguese, Bulgarian, Czech, Danish, Dutch, Finnish, Flemish, French, German, Greek, Hungarian, Italiano, Japanese, Korean, Malayalam, Norwegian, Polish, Romanian, Russian, Slovak, Slovenian, Spanish, Swedish, Turkish, Vietnamese, 简体中文, 繁體中文. The addition of a “boot-time defrag” feature (not always available in a free defrager), coupled with an improved defrag engine, makes Smart Defrag 2 a worthy competitor in a crowded freeware defrag market. Guest writer Tibor Schiemann, Co-Founder and Managing Partner of software developer TuneUp, (the TuneUp Utilities 2011 folks), walks you through Windows 7 XP Mode – what you’ll need, and how to maximize performance while running Windows XP virtualized. Part of Windows 7, Windows XP Mode (also known as “Virtual Windows”) is designed to make the transition from Windows XP as smooth as possible. It runs a full copy of the former Microsoft operating system in the background, so that Windows 7 users can install and run applications that are not compatible with Microsoft’s latest operating system. 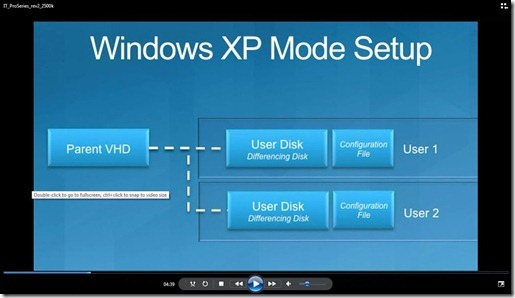 However, there are some performance issues users can run into when using Windows XP Mode. To run older applications under Windows XP Mode, you’ll first need Windows 7 Professional, Enterprise or Ultimate; it doesn’t matter if it’s the 32-bit or 64-bit architecture. Then, in terms of hardware, I recommend using at least a Core 2 Duo 2 GHz processor and having 2 GB (or more) of main memory and 20 GB of free hard disk space for Windows XP Mode. Simulating Windows XP takes up a lot of resources because you are basically running two operating systems at the same time—your Windows 7 and the virtualized XP. One bit of advice though—it is best to go with a processor that has a hardware virtualization feature, which allows Windows XP Mode to run nearly as fast as the true operating system. Without hardware virtualization, you will likely notice slower performance when working with older programs. To find out if your PC already supports this feature, download the Microsoft Hardware-Assisted Virtualization Detection Tool. Before getting started, you’ll need a few additional downloads. These include one for Windows XP Mode itself and another for the software for simulating Windows XP inside your Windows 7 system. For users without hardware virtualization on their PCs, an update is also required. In its default setting, Windows XP Mode is not tuned for optimum performance, and not all of the important features are necessarily enabled. There are many resource-draining elements because these are needed for the “real” operating system but not for the virtualized one. Here are the six most essential steps for maximizing Windows XP Mode’s performance and functionality. Share an Internet connection. Running your older Windows XP application might require a working Internet connection. To see if Windows XP Mode is connected, launch Internet Explorer. If the browser’s default website does not appear, click on “Tools” in the Windows XP Mode window and then “Settings”. Go to “Networking” and select your network adapter rather than the default setting. Hit “OK”, wait and try it again. Use Windows Update to install the latest software settings. Once your virtual computer is connected to the Internet, download the latest updates by clicking on “Start” and going to “All Programs/Windows Update.” Install all of the pre-requisite updates, and once you’re finished, select all of the “High Priority” updates using the “Custom” view. Then, go to the optional software category and install the updates that are necessary for Windows XP Mode machine. Disable sounds. To do this, go to “Start” and then “Control Panel”, and click on “Sounds, Speech and Audio Devices”. Hit “Change the sound scheme”, select “No sounds”, and then click on “No” and on “OK”. Use Turbo Mode. 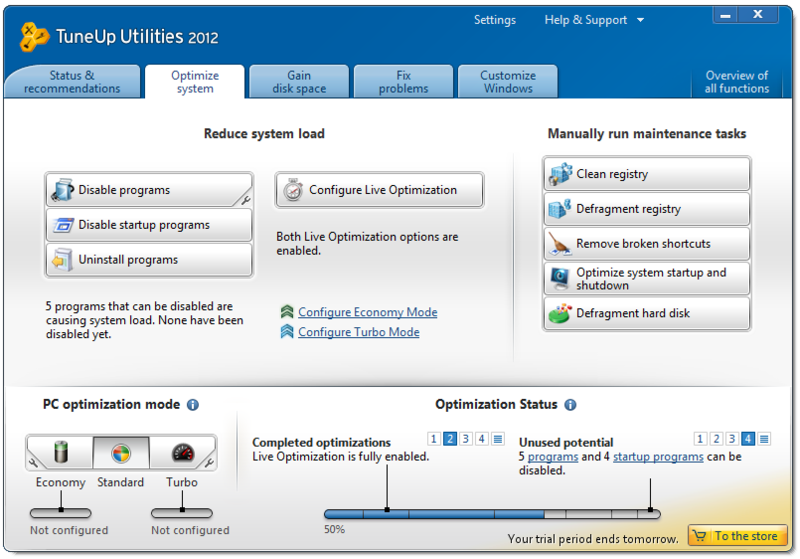 This TuneUp Utilities feature is perfectly suited to a virtual environment. With one click, it disables many Windows XP Mode features that aren’t necessary and only consume memory as well as processor resources, such as automatic defragmentation, maintenance tasks and synchronization features. This stuff is important for actual Windows XP PCs but not for running older programs. Run your old programs. Finished installing all of the legacy applications? Log off from Windows XP Mode and hit the “X” to close the virtual machine. 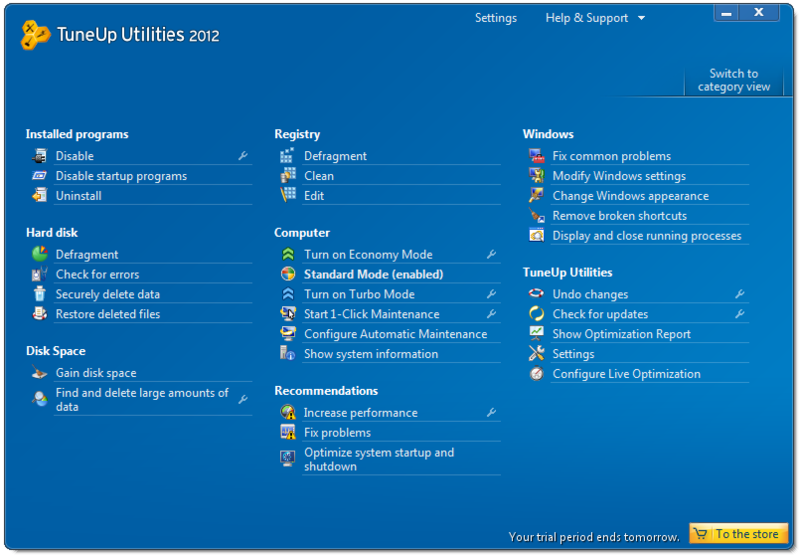 All of the programs you installed will be available in your Windows 7 start menu. Moving forward, as soon as you launch one of these Windows XP Mode applications, “Virtual Windows” will run in the background—but the actual program feature will, in fact, appear as a regular program window under Windows 7. With these Windows XP Mode tweaks, you’ll be able to squeeze as much performance and functionality as possible out of your virtualized machine. For more background information on Windows XP Mode, a step-by-step guide on setting it up and common “Virtual Windows” FAQs, visit the TuneUp Blog about Windows. 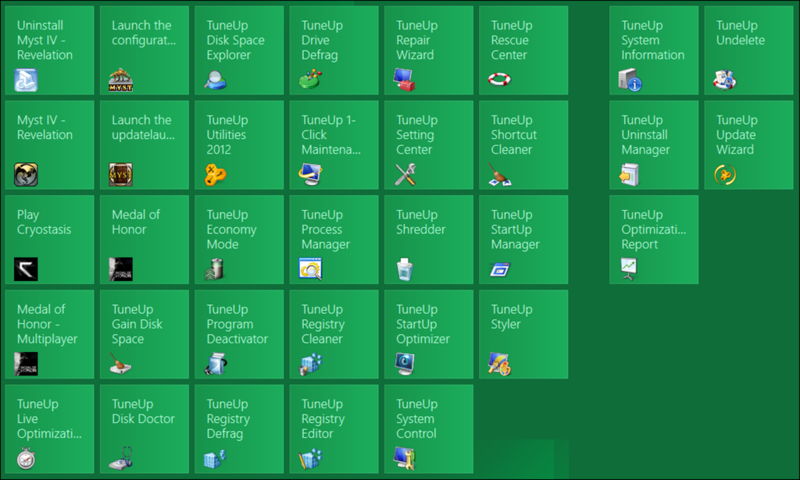 The Winners in the TuneUp Utilities 2011 Free License Giveaway Are…..
I’m happy to announce the 5 winners of a free license (installable on up to 3 PCs), for TuneUp Utilities 2011, a superior tune up application that’s easy to setup, customize and run, for both less experienced, and expert users alike. Each winner has been notified directly. If you weren’t one of the lucky winners, you can test drive this great application for 15 days, by visiting the TuneUp Utilities 2011 download page. Thank you, to all those who participated. This limited license giveaway contest was the most subscribed to ever, here on Tech Thoughts, and if I had my way, each one of the entries would have been awarded a license. I think a strong business case can be made for doing so. Zemana AntiLogger, for example, did just that here on Tech Thoughts earlier this year, which resulted in the awarding of 2,000+ licenses. Now that’s how to generate interest in a product! 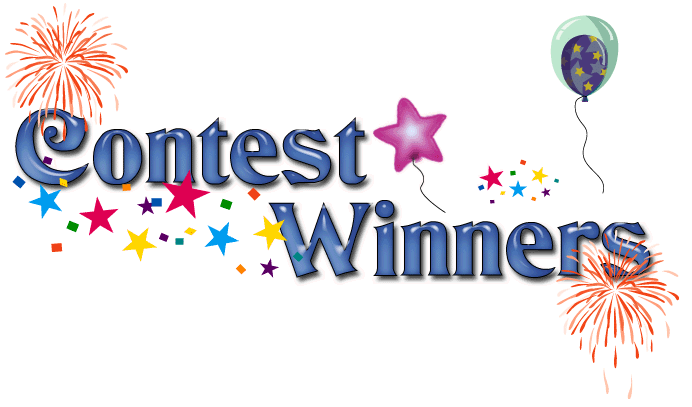 Finally, I’d like to mention that I was struck by how polite the contest participants were – in almost every case, the participants said “Thank you”. That seems to fly in the face of all the hype we hear, that we are become a less polite society. That sure wasn’t evident here. Just a quick reminder: Later this week we will be offering a giveaway for 10 free licenses for a great security application – PC Tools Internet Security 2011.